Our Kicker 6 1/2" sub woofers can be installed into just about any vehicle or even perhaps a door panel! 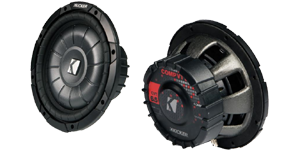 We have them available in the Kicker CVT and CVR series, the woofers work well in either a sealed or vented sub enclosure. We highly recommend paring these model subwoofers with either a Kicker 2 Channel or Class D amplifier.